Want to boost your brand and elevate your online exposure? Google offers an arsenal of tools to make it possible. Some of these services are well known, while others are a bit obscure. What they all have in common is that they can make a big difference in how your company is seen online. Check out these seven tools and see how to improve your company’s branding. If your business is brick and mortar, the first thing to do is get set up on Google Places. This ensures your business will show up prominently on searches and on Google Maps. Potential customers will readily find your hours, website and other key information. Google owns more than 60 percent of all search traffic, and you don’t want to miss out by neglecting this chance at online visibility. It’s one of the easiest things you can do to raise your company’s branding for free. Mastering the Google Adwords advertising service isn’t simple, and there’s a whole industry dedicated to teaching people the ways of Adwords. However, it’s easy enough to get started and experiment. With Adwords, you can set an advertising budget for your business and then target certain geographic areas and keywords. Your ads will show up in search results. You pay on a per-click basis, and you set the maximum amount you’re willing to pay per click. There’s a lot of potential if you tweak the settings to ensure the right kind of customers see your ads. There are numerous case studies on how businesses have effectively leveraged click-based advertising, so give these examples a look. Google Analytics is a no-brainer for websites. Using this free service gives you a good look at exactly how visitors are finding your website and how they’re using it. You can analyze the effectiveness of your Adwords campaign, in addition to a host of other customizable factors. This is a powerful tool, and leveraging the results allows your brand to truly grow. You can see where people are dropping off from the site (is there a design flaw that needs to be fixed?) and what sources are bringing in not only the most traffic, but also the highest-quality customers. There is a premium version of Google Analytics, but at $150,000 it’s not needed for most companies. There’s a lot more to Google Maps beyond having a listing through Google My Business. The maps can be customized and shared with your customers, which is especially useful for companies with various locations or properties to show. For example, most successful real estate companies use maps to show multiple listings. These maps can be embedded on your website and be a great interactive tool for users. It’s a versatile tool that could be used to interest customers and provide enhanced usability. Google’s “digital cheat sheet” looks at the latest marketing trends through articles, case studies and infographics. It’s a great opportunity to find some inspiration and see what’s working. Opt in to the email newsletter to stay up to date. Keep track of competitors and industry news with Google Alerts. Specify the keywords you want results for, and then Google will send you links to the newest content containing those keywords. Think along the lines of “Los Angeles, bakery” or “New York City, marketing.” Some of the results will be a little value, but others will provide you with instant insight into what others are doing online. There could be opportunities to take over that space with your own branding. You can also get alerts for whenever someone mentions your name, which is a great way to follow-up with a “Thanks!” or keep track of links back to your site. Another way to stay connected is through Google Trends. Search a keyword related to your company and then see the word’s popularity over time in Google searches. With a little research, these trends can reveal big opportunities. There are other options from Google that might help your company from within. 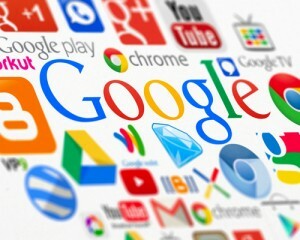 Google Apps provides employees with Gmail, online calendars, shared documents and more starting at $50 a year per user. These integrate well with some of Google’s other products – particularly AdWords and Analytics – so it might be worth considering. Even if you don’t opt for it, the above tools will help bring your company’s profile to where you want it to be.